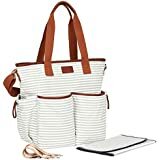 [This is not a paid endorsement; I’m just sharing tote bag information since I couldn’t find many reviews when researching this bag.] I’d seen many bloggers link to Barrington Gifts as their new favorite tote bag. 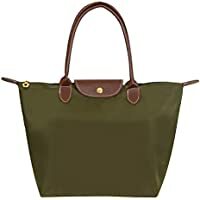 As I browsed the website, I saw several totes that I thought would be great for my daily use and have sophisticated style. They offer many tote designs and styles, along with the option to monogram; I like when a company gives the buyer an opportunity to customize a bag for a reasonable price. Here are my (not so great) phone pics, but I’m super pleased with my choice. The leather handles and bottom really add to the sophistication of the tote. I chose to not monogram the bag (in the leather square), but I think it pulls the bag together well. You can see from below some of the things I fit in my bag along with a few of the pockets. For example, on an outing with my kids this weekend, I added snacks, my diaper clutch (which holds wipes), a Kindle, extra shirt, and a bottle of water. It can hold quite a bit of gear. Also, I didn’t see the outside zipper pocket photo on the website, but was pleasantly surprised to see an extra zippered pocket. This can easily work as a diaper bag (although the interior is not nylon, so take that into consideration), but the extra side pockets are “bottle” sized which is great for baby/toddler bottles. Some of my work things, with plenty of room to spare. I like that the size is not SUCH a huge tote (size of Savannah is comparable to the Vineyard Vines tote), but it still manages to hold quite a bit. Hope this helps in tote shopping! We’ve had this bag for over a year, and it is a great bag. My daughter used it for school, so it was helpful to have all of the pockets which happen to fit a baby bottle well. I love that it zips, so her stuff doesn’t fall out. I will say this, the pink shows scuffs fairly well. It may be something to think about if you purchase; we’re pretty hard on tote bags. Here are a few more options for those who are trying to get a good bag within a budget. I actually just started using this backpack (there is a more expensive, designer version), and I do love it! Since I have 3 kids, and we’re doing a bit of traveling over the summer, I thought this would work nicely. There are so many pockets, and the side pockets (seen above) stretch and fit a good size bottle. The open top is nice, too, because I can stuff quite a bit in it. Two thumbs up for an affordable, functional bag. 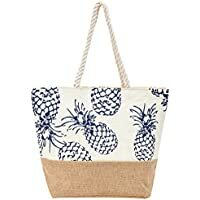 If you’re looking for something a bit more beachy, I love this pineapple tote for the pool, beach, or vacation. It zips and has pockets inside. I love the look and design of this Arrows weekender bag. It seems super functional with pockets and a cross body strap. I may have to add this to my list! Here’s an easy, affordable (ahem, knockoff 🙂 bag. While it may not have specific pockets like other diaper bags, it’s a great carryall and easy to clean. My first (and well loved) diaper bag is the Skip Hop version of this, and I love it! The grey stripe/brown leather combo doesn’t scream mom bag, and it can fit so much stuff! Highly recommend this for first time moms. 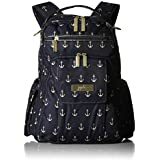 One more backpack, which is a pricey version, but it highly rated, well-made, and adorable with the nautical design! Does anyone have a Ju-Ju-Be backpack? 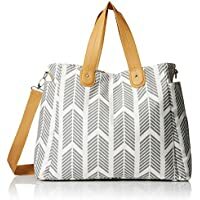 Quick Question: I am considering the St. Anne tote as a gift for a graduate (going to be a teacher in the Fall). Would you say it’s very durable? I just want to make sure it is going to hold up for her. She is looking for a nice tote to tote papers, folders, and such.